Mercury's surface temperature can vary from -300°F (-180°C) to 800°F (430°C). On Earth, the hottest temperature in the shade was 58C (136°F). Mercury is 43.4 million miles away from the sun. Mercury is the closest planet to the Sun. It is a terrestrial planet. That means a planet made from rock. Only one spacecraft, Mariner 10, has visited Mercury. Much of what we know about this planet came from this mission. Mercury is 4879 kilometres (km) across. That makes Mercury just less than half the size of the Earth. It is the second smallest planet in the Solar System. Only Pluto is smaller. Mercury's small size and its closeness to the Sun sometimes make it difficult to see without a telescope or binoculars. 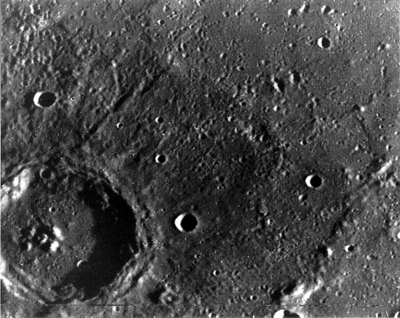 Mercury has craters like those on the Earth's moon. The largest crater on Mercury is the Caloris Basin. It is about 1300 km wide. It was created by a huge asteroid hitting Mercury. The asteroid was probably 100 km wide. It gets very hot during the day and very cold at night on Mercury. It is very hot during the day (over 400°C) because Mercury is so close to the Sun. At night, however, Mercury loses almost all its heat because there is almost no atmosphere to keep it there. The temperature can fall to almost -200°C. Mercury rotates (spins around) much more slowly than the Earth, so one day on Mercury lasts as long as 58 days on Earth! So there is plenty of time for the temperature to rise so high or fall so low. Mercury has the shortest year in the Solar System. It is about 88 Earth days long. That means there are only 1Â½ days in each Mercury year! As far as we know, the center of Mercury is made of iron. It contains more iron for its size than any other planet in the Solar System. The rest of Mercury is made of rock. If you were on Mercury, it would pull you down less than half as much as the Earth. In Roman mythology, Mercury was the messenger of the gods. He wore a hat and sandals with wings on them, allowing him to travel around the world very quickly. The planet Mercury was named after him because it moves around the Sun faster than any other planet in the Solar System. It moves nearly 48 km every second! 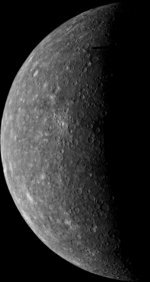 2) What is the diameter of Mercury? 1. Mercury has more of what element than any other planet? 2. What best describes the size of Mercury?